Godwin Obaseki who until recently, served as the Chairman of the Edo State Government’s Economic and Strategy Team (EST), has emerged the governorship candidate of the All Progressives Congress (APC) in the party’s primary election that was held last night in Benin City, capital of Edo state. The election ended in the wee hours of Sunday. The result of the election was declared by the governorship primary election committee headed by Governor Aminu Masari of Katsina state. It was contested by 12 aspirants. About 2,873 delegates from 192 wards of Edo state were accredited for the primary election. Obaseki scored a total of 1618 votes to emerge APC’s flag bearer over his closest rival, Pius Odubu who happens to be current deputy governor, having 471 votes. 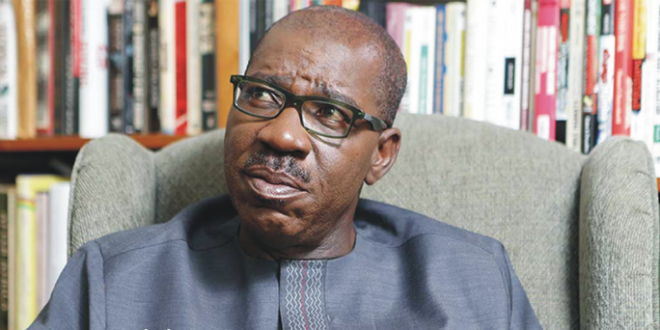 Godwin Obaseki was born in Benin City, Nigeria to the famous and illustrious Obaseki family. Mr.Godwin Obaseki, was until his election as APC candidate, Chairman of the Edo State Government’s Economic and Strategy Team (EST), a position he has held since March 17, 2009 Pro bono publico.